This Currier & Ives print titled “Wooding up on the Mississippi” depicts the steamboat Princess taking on firewood for its engines. Such pleasant and reassuring scenes were produced for the American masses, creating romantic images that linger to this day. Of course, the reality of everyday life along the banks of lower Mississippi was far from idyllic. By the middle of the nineteenth century, there had been over 4,000 fatalities on riverboats due to boiler explosions alone. In addition to such hazards, there was the pervading institution of slavery. Having “erected its economic edifice...on the shifting sands of opportunism and moral brigandage,” the Antebellum South was an unpleasant and hellish society for most of those who lived it.1 An 1857 menu from the Princess provides unwitting historical evidence about this part of the American past. 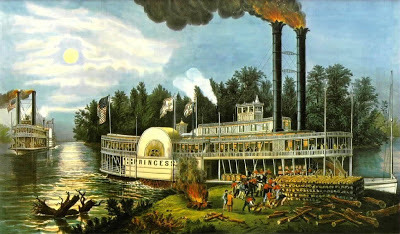 The Princess was said to be the fastest paddle steamer on the Mississippi. 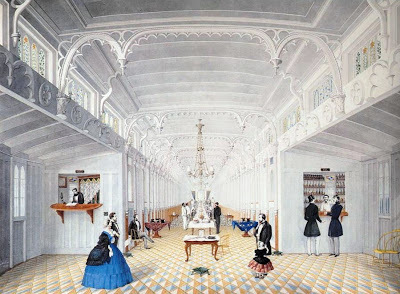 It was also one of the most elegant, as depicted in this interior painting by French-born Louisiana artist Marie Adrien Persac. 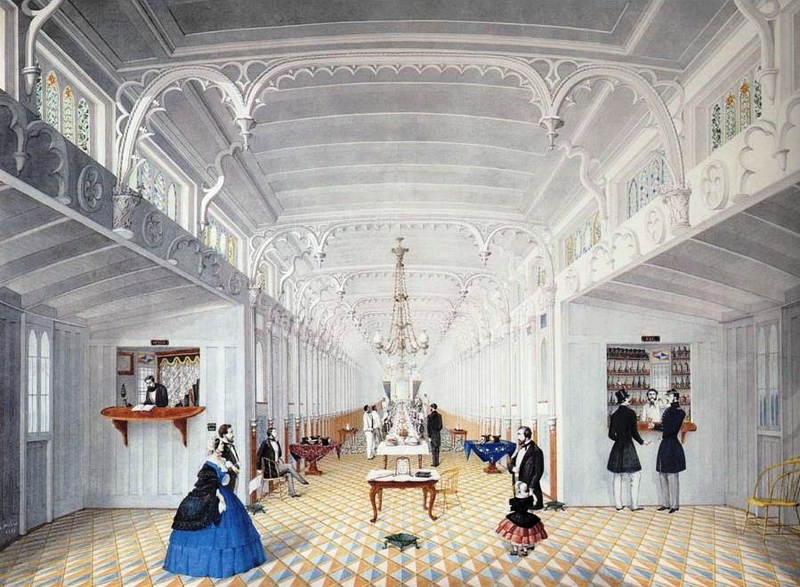 For the first-class passengers, the great central hall was transformed into a dining room four times a day, serving breakfast at 7:30, dinner at 2:00, tea at 7:00, and a cold supper from 9:00 to midnight.2 The meals were prepared and served by members of the cabin crew which comprised mostly free blacks and slaves. 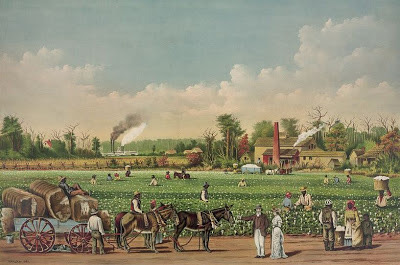 Since the Princess operated in the Deep South during the late antebellum period, the majority of its cabin and deck crews were probably slaves who had been leased from the riverside plantations. 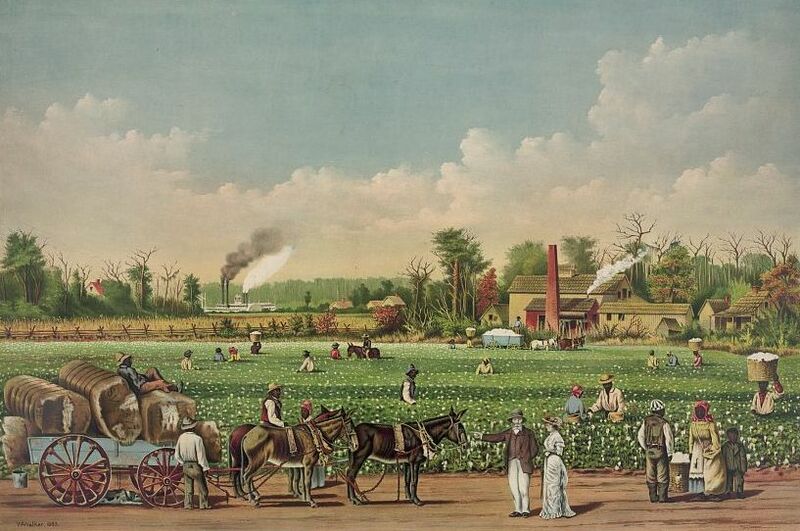 (Slightly more than half of the people who lived in Louisiana and Mississippi were then slaves.3) In the background of this painting, several African-American waiters can be seen standing at attention behind the chairs in the dining room. Waiters ranked high in the hierarchy of riverboat workers, as did barbers. On the lower decks, there were more slaves than free blacks who labored as firemen and the roustabouts, loading and unloading the cargo. About two percent of the riverboat labor force were enslaved women working as chambermaids. The U.S. Mail Packet Princess, and its sister boat Natchez, each made the round-trip from New Orleans to Vicksburg once a week, promptly departing at 5:00 PM on Tuesdays and Saturdays, respectively.5 Paddling upstream for 300 miles, they stopped at Donaldson, Plaquemine, Baton Rouge, Port Hudson, Bayou Sara, Red River Landing, Fort Adams, Natchez, Waterproof, Rodney, St. Joseph, Grand Gulf, Warrenton, and finally Vicksburg. The steamers transported hundreds of passengers and tons of cargo, stopping at the rural backwaters to pick up the 400-pound cotton bales for the textile mills in New England and Europe. The map below, also by the artist Marie Adrien Persac, shows the large plantations that lined the Mississippi River between New Orleans and Natchez. Those growing cotton are shown in red and blue; the sugar plantations are indicated by green and yellow. The menu below is dated April 19, 1857, approximately four years before Confederate forces opened fire on Fort Sumter. The heading and delicate border was printed by Henry Spencer’s Magic Press on Poydras Street, immediately adjacent to the docks in New Orleans. The names of the dishes appear to have been added later, possibly printed on board prior to the meal. Based on the regular schedule, this Sunday dinner was served a few hours after the steamer departed Baton Rouge, churning south on the last leg of its weekly run. Since high-class steamboats like the Princess attracted customers with the quality of its food, the crew may have procured fresh provisions in Baton Rouge that morning. Although regional influences are generally muted on menus of the era, this bill of fare features local seafood dishes like baked redfish, broiled pompino (sic), and stuffed crab. On the surface, this menu appears similar to other American menus of the period, but there are some differences. For one thing, there is no French, despite the fact that the region was colonized by France; there was even a small group of wealthy, slave-owning planters known as the “genteel Arcadians.” It was unusual not to use at least some French on upper-class menus in the United States. The low-cost pasta dish, here called “macararonia,” was ubiquitous in the nineteenth-century. Its presence on this menu reminds us that operating a steamboat was a competitive business. The profit motive also determined what foods were given to slaves. In addition to planting their own gardens, slaves typically received a ration of vegetables each day in order to reduce meat consumption. Culinary historian Sam Hilliard argues that the planter elite consumed much of the same foods as their slaves, only in greater quantities and with more variety.5 There are a lot of vegetables on this menu relative to comparable menus in the North.7 Although climate and season played a role, these vegetables may also suggest that the foods routinely eaten by slaves ultimately influenced the diet of the white upper classes in the antebellum South. Diary products, which were relatively scarce in some parts of the region, may have represented the biggest difference in their respective diets. Although eyewitness accounts vary, whites used most of the milk when in short supply, occasionally giving any surplus to enslaved children. Other dairy products, such as the vanilla ice cream on this menu, were almost never made available to slaves. “I have a vivid recollection of a tragedy which happened in those days which often troubles the dreams of my old age. I was an eye-witness of the blowing-up and destruction by fire of the Princess, the finest steamboat on the Mississippi in those days. The night before the disaster my father and mother had kissed me good-bye and gone on board of an old dismantled steamboat, which answered the purposes of a wharf, to await the arrival of the Princess, as they intended to take passage on her for New Orleans. Early the next morning I went down to the river to find out if they had yet left. “The Princess had just drawn out into the stream, and as I stood watching her as she glided down the river, a great column of white smoke suddenly went up from her and she burst into flames. She was loaded with cotton. As though by magic the inhabitants of the town gathered at the riverside and in the crowd I spied my brother-in-law, Charles La Noue, in a buggy. He called to me; I jumped in alongside of him and we dashed down the river road in the direction of the burning boat. The road was rough and the horse was fast. The high levee on our right shut out the view of the river, so we could only see the great column of smoke. On our left were the endless fields of sugar cane, with an occasional glimpse of a planter's house set in a grove of pecan trees. 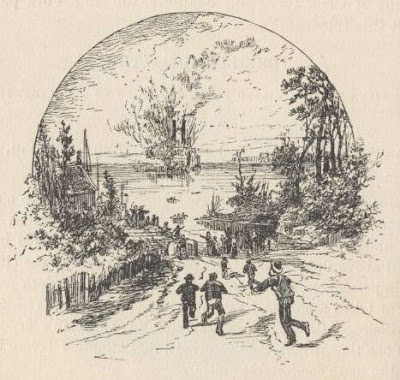 “At last, in a great state of excitement, we arrived at the plantation of Mr. Conrad.8 ‘Brother Charlie’ jumped out of the vehicle and ran toward the house while I made the horse fast to a tree. I then mounted the levee from where I could see floating cotton bales with people on them; men in skiffs, from both sides of the river, were rescuing the poor terror-stricken creatures and bringing them ashore. From the levee I rushed into the park in front of Mr. Conrad’s residence and there saw a sight which can never be effaced from my memory. Mr. Conrad had had sheets laid on the ground amidst the trees and barrels of flour were broken open and the contents poured over the sheets. As fast as the burned and scalded people were pulled out of the river they were seized by the slaves and, while screaming and shrieking with pain and fright, they were forcibly thrown down on the sheets and rolled in the flour. The clothes had been burned off of many of them. Some, in their agony, could not lie still, and, with the white sheets wrapped round them, looking like ghosts, they danced a weird hornpipe while filling the air with their screams. Terrified by the awful and uncanny scene, I hid behind a huge tree so that I should not see it, but no tree could prevent me from hearing those awful cries and curses which echo in my ears even now. 1. William Faulkner, Absalom, Absalom!, New York: Random House, 1951, p. 260; J. B. Calvert, The Myth of the Antebellum South, essay, University of Denver, 2000. 2. The captain often provided a stove to deck passengers who also had the option of buying low-cost meals from the kitchen. 3. According to the 1860 census, slaves comprised 51% of the population in Mississippi and Louisiana; free blacks represented only 1.25% of the population in those states. 4. Thomas C. Buchanan, Black Life on the Mississippi: Slaves, Free Blacks, and the Western Steamboat World, University of North Carolina Press, 2004. 5. The steamer Princess was built in Cincinnati in 1855, as was its sister boat Natchez V that operated until 1859, when it was permanently moored at Baton Rouge as a wharf boat, serving as a hotel, depot, and storehouse. 6. Sam Bowers Hilliard, Hog Meat and Hoecake: Food Supply in the Old South, 1840-1860, Southern Illinois University Press, 1972. 7. A cursory look at American menus from the 1850s suggests that there may have been more vegetables on Southern menus, but a statistical analysis of all extant menus is needed to confirm this observation. 9. James Morris Morgan (1845-1928), Recollections of a Rebel Reefer, 1917. 10. 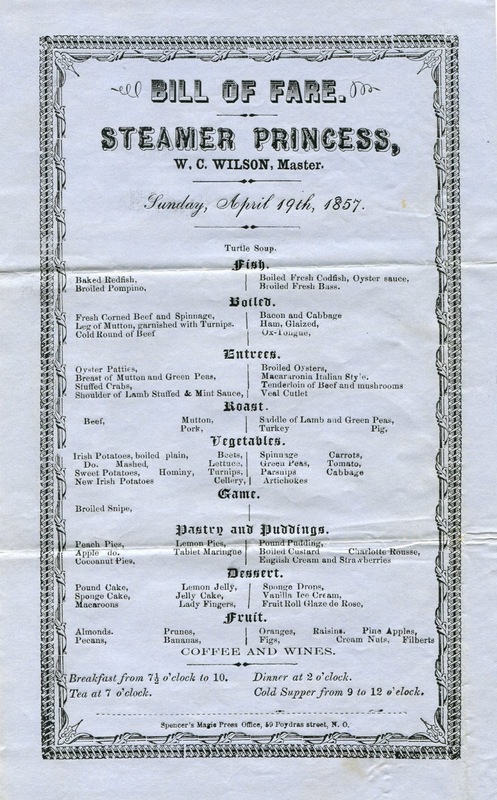 Detained on business in Nashville, Captain William C. Wilson (whose name appears on this 1857 menu) was not piloting the Princess on the day she exploded. 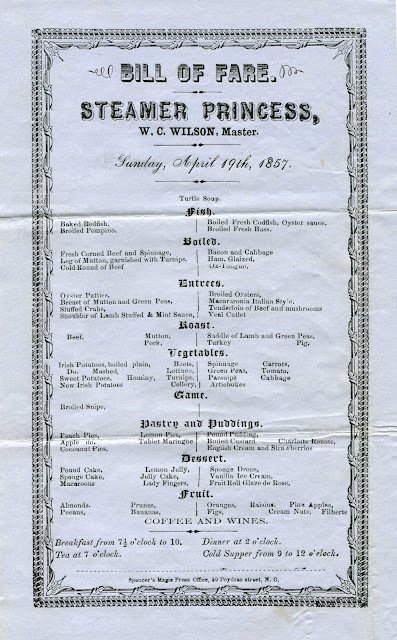 (Nashville Patriot, 8 March 1859) A menu in the University of Houston Library from the steamboat Charmer on 29 February 1860 shows Wilson as the captain. The 1860 menu features a couple of French names, such as macaroni a la Italienne, and shows spinach spelled correctly. Great post. I heard a paper by Paul Freedman in which he and his students had counted the dishes on quite a number of 19th century menus and he found that macaroni was one of the very most common selections, maybe for the reason you suggest. A stellar post Henry... and deeply moving with the account. We tend to forget the human cost of the hoopskirted good life in those days. You have made it quite clear. On a food note, I always wonder when the transition was made between macaroni being a pricy fashionable thing to food for the masses (put a feather in his cap and called it macaroni)?